All proceeds from the sale of artwork will go to the renovation of Shanley House. When: Saturday, September 19, 2009 (time TBA). Lake Granbury Art Association's Fine Art Auction featuring original art only, no prints or copies was a great success. Final numbers aren't in yet, but we have easily raised over $10,000 to put toward renovations to our 130 year old home. We thank everyone from our sponsors, to our artists and volunteers and especially the art lovers who attended the auction. It took all of you to make this event a success and we hope to see you next year! Visit our main site at www.granburyart.org to keep up with LGAA events year round. 100% of proceeds go to the restoration of the historic Shanley House - home of the LGAA. This is a Testimony - Walk in Faith My Friends...All The Glory Goes to God! I was finally able to make an Art Association Meeting after two months. I missed most of our Christian Biker Rally; too. Missed the Acts Ministry Sermon's in Stephenville.That flu really was bad! The Good News...With donations from sponsors, banquet, and the art sale we raised right at $11,000 to help restore Shanley House. ( http://www.tuckerrocky.com/lgaa.nsf/home?openform ) I was listed as number 72 in the Catalog out of 72. 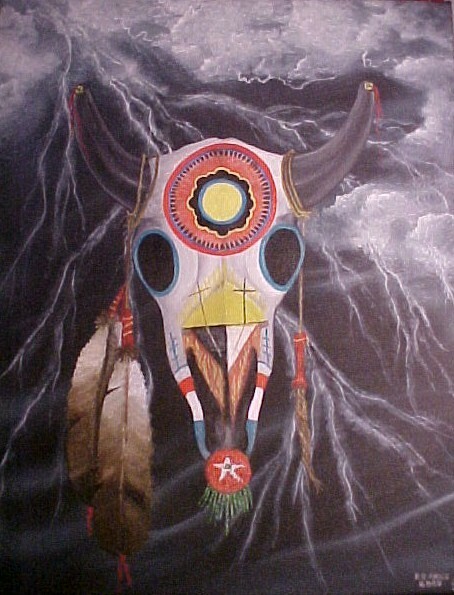 All 72 art pieces were sold....The top selling pieces were in the Native American and Native Culture areas and there were 5 paintings in that catagory including mine. The paintings in all other catagories sold for the average price of $115.00. 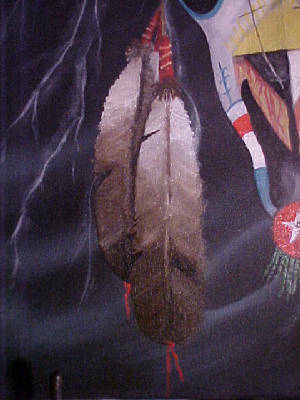 All 5 paintings in the Native American and Native Culture went for $300.00 each...Woo! Hoo! What a Blessing! I wondered about the reaction to the painting. I only had a couple of days to paint it and had to use the blow dryer on it. I couldn't afford a new frame and took a 20 year old gold leafed frame off of a personal painting. You do what you have to do. Right? I was waiting to ask about it. The public market is a fickle market. "It was that last painting that was sold that was dramatic; they said..."
It received public mention and a married couple came to the Auction and sat thru all 72 sales in order to buy it. No one was more surprised than me. There had only been two or three days to start and finish it! And a first attempt at that particular subject. I asked if they sold the paintings in order; by the catalog number; since mine was last? They said; "Yes." "Why Bob...that was your painting..."
The married couple expected to pay twice the price if necessary; she said. Wow. That took a minute to soak in. Those people wanted to meet me; but the flu had a firm grip on my collar the night of the auction! About that time some of you were praying that I would get over the flu...I was praying I would 'die' because I would have felt better than I did right then....Rough Ride....All better now. If you can't laugh at the down-turns the up-turns aren't as much fun! But the art sale was good news. 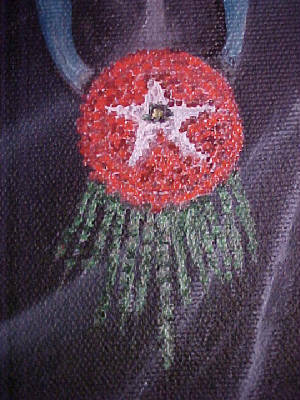 Sales in 1991- 92' of my oils for the same size painting were at $250.00...except for all of those I gave away; which Blessed the others! Amen.